Syracuse’s enormous upset over Duke Monday night had to surprise even the most ardent Orange fans. 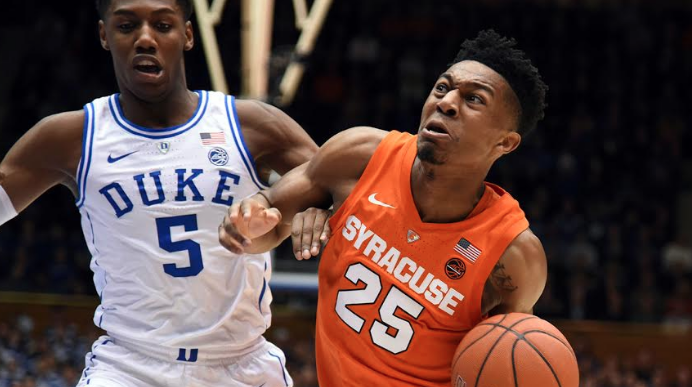 While the Blue Devils were missing Cam Reddish, who was out with an illness, and then lost Tre Jones in a collision during the game, it was still an incredible effort by Syracuse. The Orange was a 17-point underdog according to many sportsbooks, showing just what type of odds were stacked against SU. At times this season, the Orange have looked lethargic and lost. The 5 losses already piled up before mid-January has the Orange no longer ranked, and models predicting yet another bubble year for the NCAA Tournament. But the win at Cameron Indoor as superstar Zion Williamson had the best night ever for a Duke freshman must make all basketball observers wonder if SU actually has a whole different gear to kick into. Tyus Battle was impeccable all night (32 points, 4 assists), hitting monster shots in front of a delirious road crowd. He was the floor leader, and proved just how valuable his play is in big games like this. But how about Frank Howard? He added 16-5-5 and was the type of contributor that can make SU dangerous when he’s filling up a box score. When he’s been quiet and passive, SU just simply isn’t as tough to defend. Elijah Hughes knocked down 4 threes, as he added 20 points. And how about the toughness of Pascal Chukwu? A beastly effort under the rim with 18 huge rebounds. Outside of The Goggled-One, SU only got three points off the bench, so the depth once again was in question. But that is life for SU hoops every year, and this win has to make one question just how big its potential is when it plays like this. Putting up 95 points (in OT) on the road against the best team in the country is a statement. It will be used in favor of the SU resume when the tourney bids are being given out and inevitably the Orange are once again on the bubble. But the slogs against UConn and ODU, and the 59 points against Georgia Tech, feel like a totally different team. Yes, the Orange are capable of uninspired efforts. But they are also capable of knocking off Duke at Cameron Indoor when everything clicks. And because of that, SU just injected a whole new dynamic into its season.